According to early Dickens bibliographer John Eckel, this copy is the first edition, fourth issue of The Battle of Life. It was illustrated by Daniel Maclise (1806-1870), Richard Doyle (1824-1883), Clarkson Stanfield (1793-1867), and John Leech (1817-1864). The Battle of Life was the fourth Christmas novella published by Dickens. In general, critics gave the book poor reviews, considering it overly sentimental, although sales of the book were brisk. Dombey and Son; with Illustrations by H.K. Browne. London: Chapman and Hall, 1875. The seventh novel published by Dickens, Dombey and Son, was wildly popular with contemporary audiences. To put Dombey and Son’s popularity into perspective, while it sold 34,000 copies in June 1838, Thackerey’s Vanity Fair, being published at the same time, sold around 5,000 copies that month. The Haunted Man and the Ghost's Bargain. A Fancy for Christmas-time. London: Bradbury & Evans, 1848. This is a first edition of Dickens’s fifth and final Christmas novella. It was illustrated by Sir John Tenniel (1820-1914), William Clarkson Stanfield (1793-1867), Frank Stone (1800-1859), and John Leech (1817-1864). 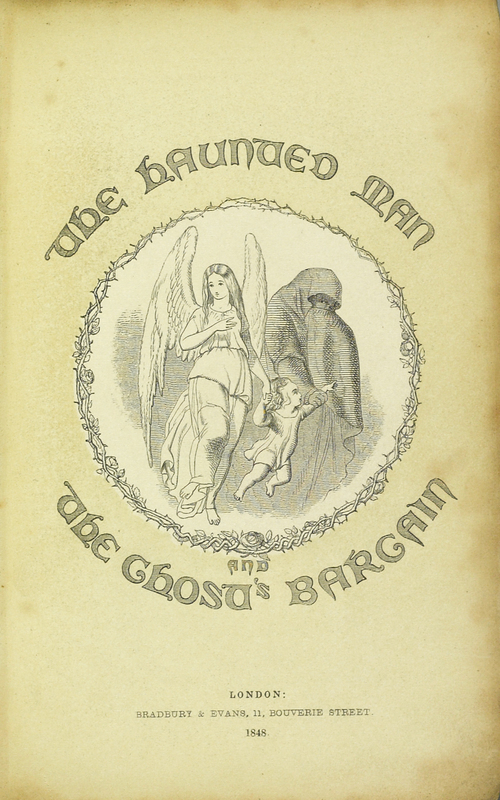 The Haunted Man did not sell well, with copies of the original printing remaining unsold at the time of Dickens’s death in 1870. Christmas Stories: From “Household Words” and “All the Year Round”. London: Chapman and Hall, 1876. In 1847, Dickens wrote Dombey and Son. Writing that novel took so much of his time that Dickens decided he would not be able to publish a Christmas book for 1847. However, he did not want to disappoint his fans that were expecting A Christmas tale. Instead of a novella, he wrote a short story for Household Works, a periodical for which he was the editor. These short stories proved to be so popular that Dickens continued the practice of publishing a short story at Christmas when he left Household Works to edit All the Year Round. This volume is a collection of those short stories. 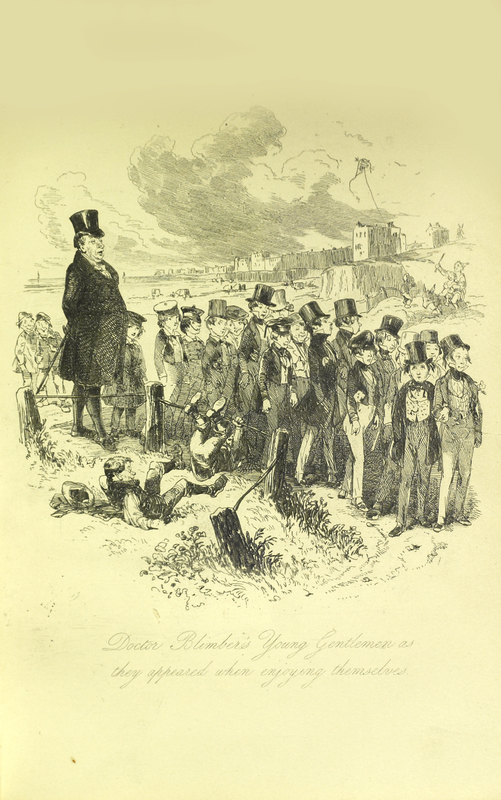 The Personal History, Adventures, Experience, & Observation of David Copperfield the Younger of Blunderstone Rookery; (Which he never meant to be published on any account. ); with Illustrations by H. K. Browne. London: Bradbury & Evans, 1849-1850. 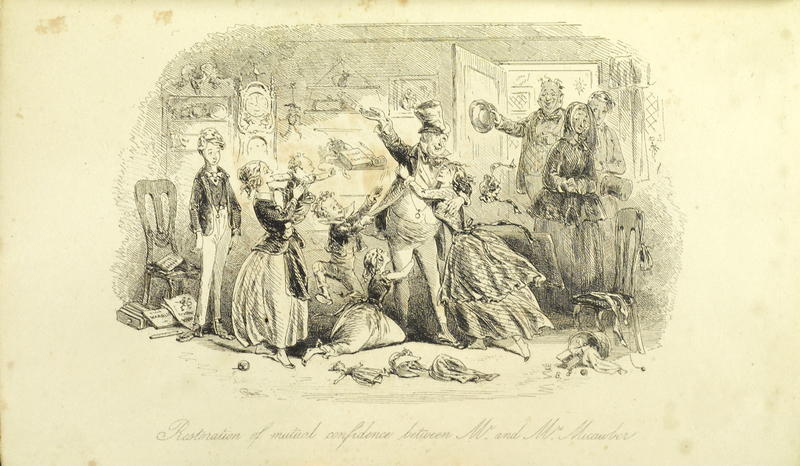 David Copperfield is considered to be Dickens’s most autobiographical work. Dickens identified it as his personal favorite of all his novels. Memorable characters from this book include Mrs. Gummidge, ‘umble Uriah Heep, and the ever-willing Barkis. 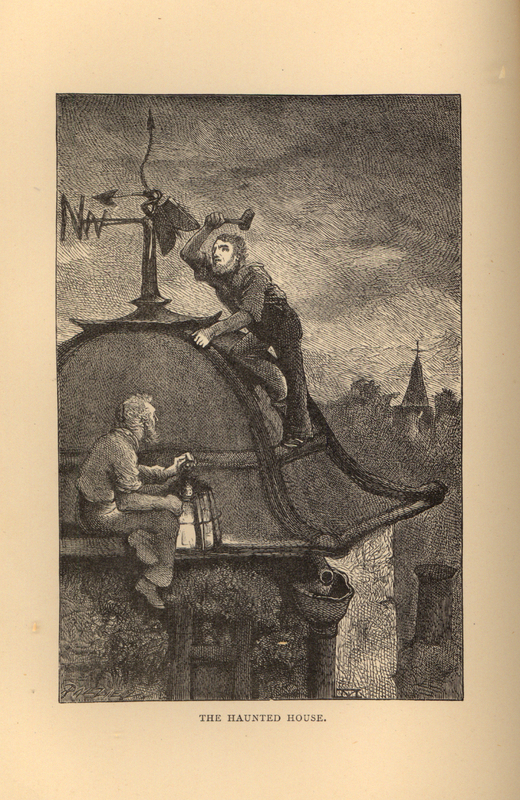 Hablot Knight Browne’s illustrations bring those timeless characters to life. David Copperfieldwas first issued in twenty numbers in nineteen parts. It was assumed that subscribers would have their issues bound upon receipt of the final chapter – a general title page, an engraved general title page, dedication, complete table of contents, and errata sheet were included with the final number.